It’s been nearly two years since Heather Jones first contacted us about getting some batting for a new book she was working on. It’s always amazing to witness a book in progress — to see all of the pieces involved, the inspiration, the craftsmanship, the art. In Heather’s case, we knew we’d be wowed, but upon seeing the final publication, the wow-factor was even greater than anticipated. Quilt Local: Finding Inspiration in the Everyday is filled with Heather’s genius, guiding us through her process, how to turn everyday scenes into works of art, how to pair colors for maximum impact, and her thoughts behind quilt design. The artwork is stunning, the insight inspiring and all that before even getting to the 40 (!) projects she includes. I personally adore the stories that Heather shares about each quilt. She describes what inspired the design, the history behind the location and truly makes you feel as though you’ve become a part of the story. She empowers readers to take the designs and make them their own, as well as to find inspiration in their own surroundings. It’s not just a book about quilting, it’s a book about finding your voice and your art. We love it! Heather used Pellon Batting throughout and we couldn’t be more honored to be even a small part of such a beautiful collection. While it’s tough to pick a favorite amongst so many works of art, my eye was immediately drawn to Indian Hill (pg. 146). Heather describes a wooden dock at a family friend’s pond which made my think of my own childhood, growing up on a lake in a small country town. I’m more than familiar with the interlocking boards that make up a dock, weathered and full of stories of their own. The story then led me to think about another favorite childhood spot — Two Lights State Park in Cape Elizabeth, ME. I spent many an adventurous Saturday there when I was little, jumping from rock to rock with my dad, exploring the pools, examining barnacles and other small sea life. The rocky coast partnered with the classic lighthouse embodies the spirit of coastal Maine, something that will forever be a part of who I am. I’m hopeful that Heather’s book will help me to someday create a small piece of quilted art using this stunning spot as inspiration! I would strongly encourage you to take a closer look at Quilt Local: Finding Inspiration in the Everyday. 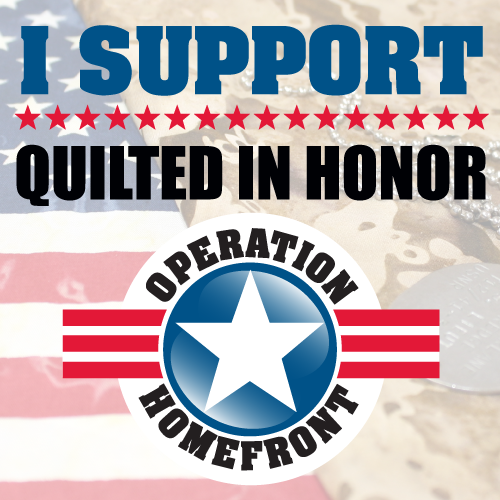 Whether and experienced quilter, or a beginner, I guarantee you’ll be inspired! And just because we can’t help ourselves, a little batting giveaway to perk up your weekend a bit. We’ll be giving away a throw-sized package each of our Pellon Nature’s Touch Bamboo Blend Batting and Pellon Nature’s Touch 100% Natural Cotton Batting w/scrim. To enter-to-win, leave a comment telling us about a location near you that you find inspiring. Giveaway is open until 11:59pm on Thursday, October 22. We’ll draw a random winner (thank you random.org) on Friday, October 23. We’ll announce here and on Facebook! Due to shipping restrictions, this giveaway is open to US/Canada residents only. Good Luck! Don’t forget to take a peek at all of the other stops along the tour! Read about other inspiring locations, check out reader versions of the projects and more! Heather Jones is a quilt designer and teacher and is the founder and former president of the Cincinnati Modern Quilt Guild. She has a BA and MA in Art History from the University of Cincinnati. 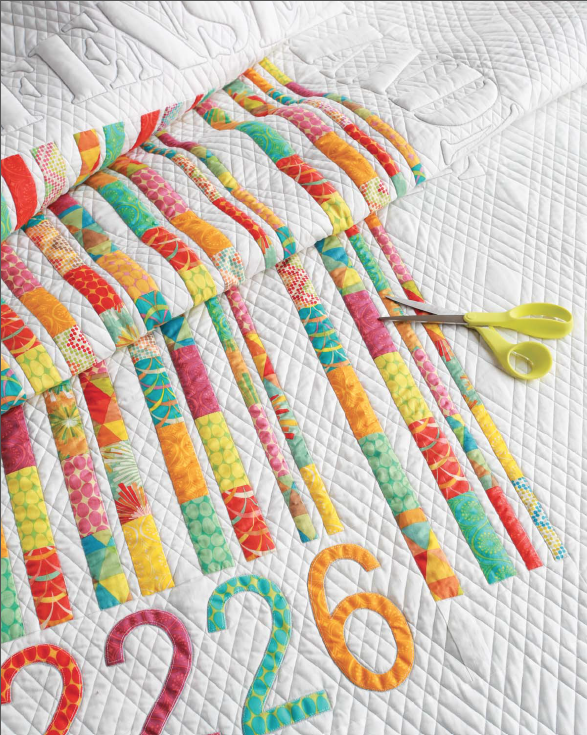 Her quilts have appeared in numerous books from Martingale and Stash and in magazines such as Martha Stewart Living and Modern Patchwork. She teaches online classes for CreativeBug.com, on Quilting Arts TV, and around the country with workshops. You can see her work at HeatherJonesStudio.com. I did a little happy dance around my house on the day that Modern Quilt Perspectives by Thomas Knauer showed up in my mailbox. I, like many, had been waiting for this release for quite a while, having had little sneak peeks of quilts and hints at the content. I first met Thomas at Spring Quilt Market 2012 in Kansas City. 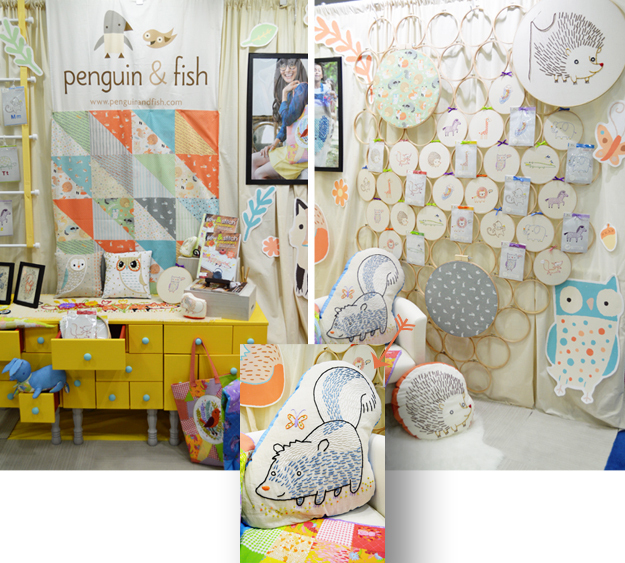 It was my very first Quilt Market and I’d been working in the industry for less than 6 months. I think we were introduced by a mutual friend, but I distinctly remember him coming by the booth to chat. An initial inquiry about different types of batting turned into a discussion about my history in the music industry, pop culture, and plans for a theoretical NorthEast quilt market at which we’d share a booth, play music, and sit in rocking chairs. Crazy? Perhaps. Fabulous? Of course;). I knew right away that I’d found a friend. He was one of the people who made me feel at home in this new business and one of the first to introduce me to this amazing world of creativity. Thomas wrote to me about a month later with a request for batting for his upcoming book, seemingly still just a concept, albeit a very well thought out one. The initial pitch spoke to me — his aim was to create something that wasn’t just about pattern and perspective, but about the meaning and the beauty behind the process of creating a quilt. While I knew that his book would be different, that it would be a stand out in the sea of quilting books, I never quite realized how much I would truly love it. Modern Quilt Perspectives reads like your new favorite book… Thomas has clearly put his heart and soul into his representation of modern quilting, offering thoughtful and practical instruction alongside social commentary and personal exploration. Each quilt featured comes with a story, a background, an inspiration. The quilts are made to make us think and to appreciate. They are meant to inspire and to enhance our lives. With that in mind, one of my favorite quilts in the book is Ampersand. 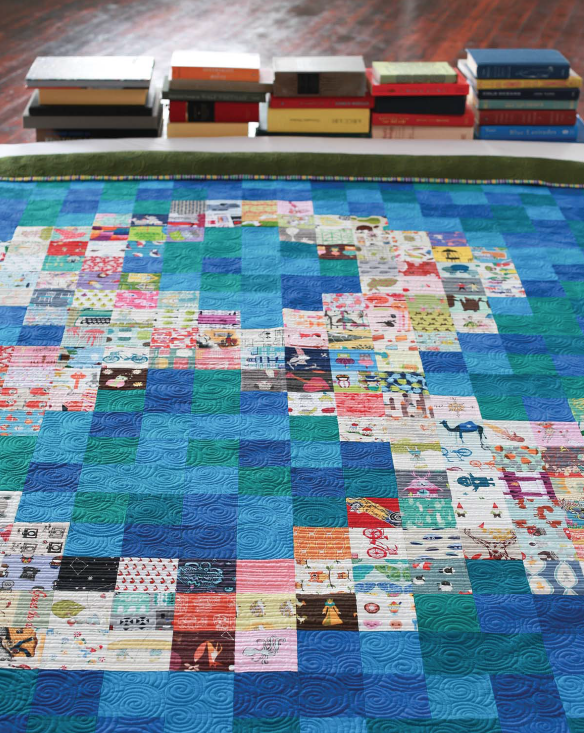 In Thomas’s words, “it is a storytelling quilt, a sort of choose your own adventure.” The quilt features a giant ‘&’, made of of individual squares, each with a different pattern or image. Thomas uses it as a source of inspiration for new stories with his daughter. Pick an image, start a story, keeping adding to the story with ‘and’ plus another image. 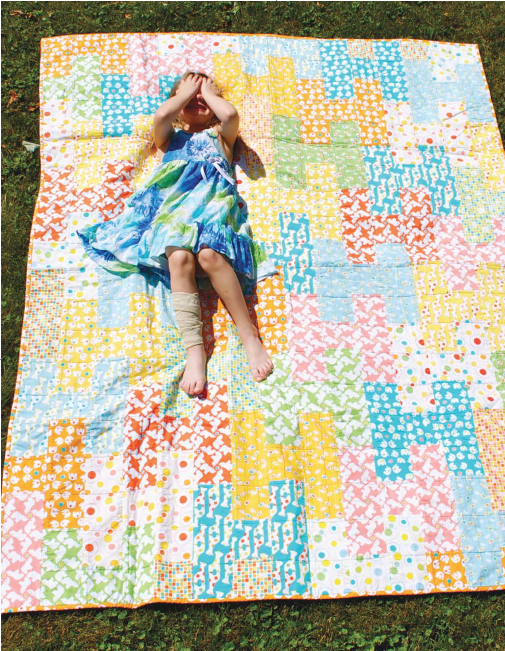 There are endless possibilities and I can’t help but daydream about a quilt like this for my own daughter. Another favorite is Reunion. The pattern is given for 4 separate mini quilts, but the concept allows for many more. 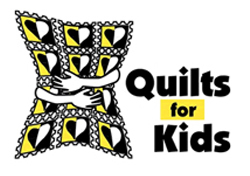 The idea is to create a series of small quilts that, when collected and combined, make up one large quilt much like individuals coming together to create one whole family. One of the first ‘sneak peeks’ I had of the book was with In Defense of Handmade. At first, I only got a partial glimpse of the quilt, but I could tell that Thomas was ecstatic. The concept, the execution, and the stunning quilting (by the incomparable Lisa Sipes) all contributed to one giant masterpiece. The quilt is an enlarged replica of a UPC code for a mass-produced, factory-made quilt that was marketed as hand-crafted. For Thomas’s thoughts, well… you’ll just need to grab a copy of the book;). Though not listed in the book’s contents, the final quilt of the book could just be my absolute favorite. It is a tribute to Thomas’s relationship with his daughter and gives us a look at what it means to be an amazing father. The book starts with a dedication to her and ends with a quilt inspired by her. It is beyond sweet, really, and makes me love the book even more. So, Thomas — I’m cheering for you! This book will be a favorite for years to come. I feel honored to know you, am endlessly inspired by you, and am always looking forward to what you’ll do next. 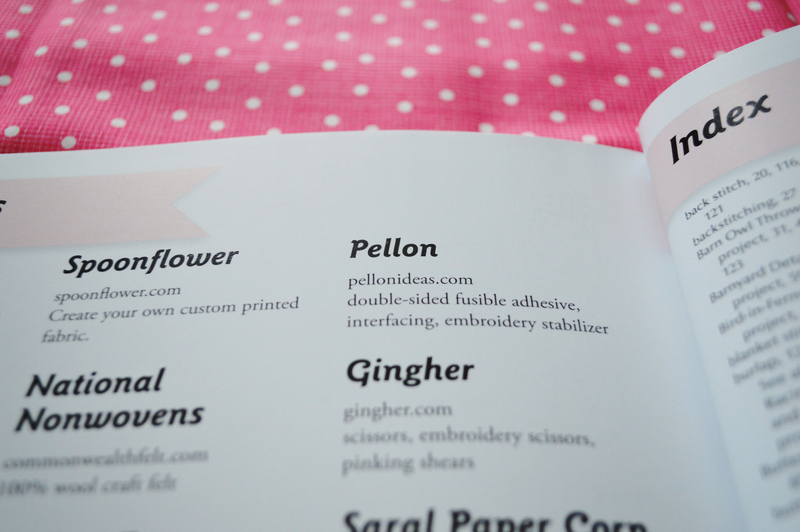 We at Pellon® are honored to have been even a small part of the process — the ‘magic in the middle’;). Want your very own copy? Let us know what inspires you to create, or tell us the story behind your favorite quilt in the comments below. We’ll accept entries through next Friday, April 4 and will announce the winner on Saturday, April 5. Congratulations to Katelyn @ Sing While Crafting!! She was #29 out of a total 59 entries. Thanks to all for playing along, and if you’re aching for your very own copy of Modern Quilt Perspectives, you can grab one right here. 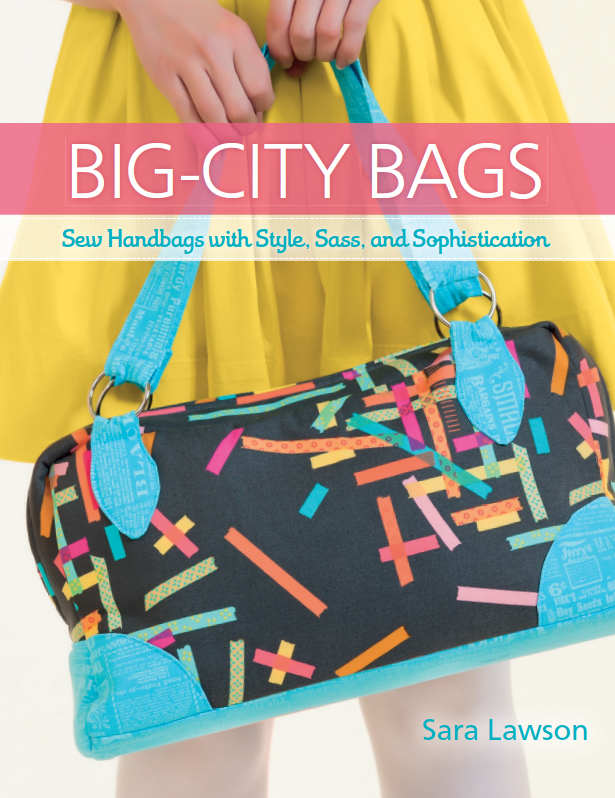 Big-City Bags (available through Martingale) is the very first book release by designer Sara Lawson and we’ve been looking forward to it all year! Sara is one of Pellon®’s beloved designers and she was one of the very first to sign on for the Pellon® Project Designer program. 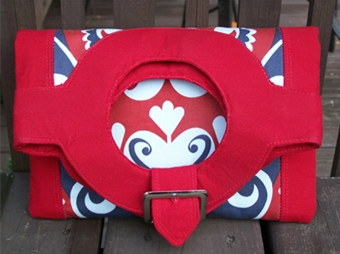 Since then, she has contributed over 10 unique projects, most of which are fabulously stylin’ handbags. Sara has a great eye and a keen sense of style and her patterns speak to a large audience of sewists. It’s been incredible to follow her story. 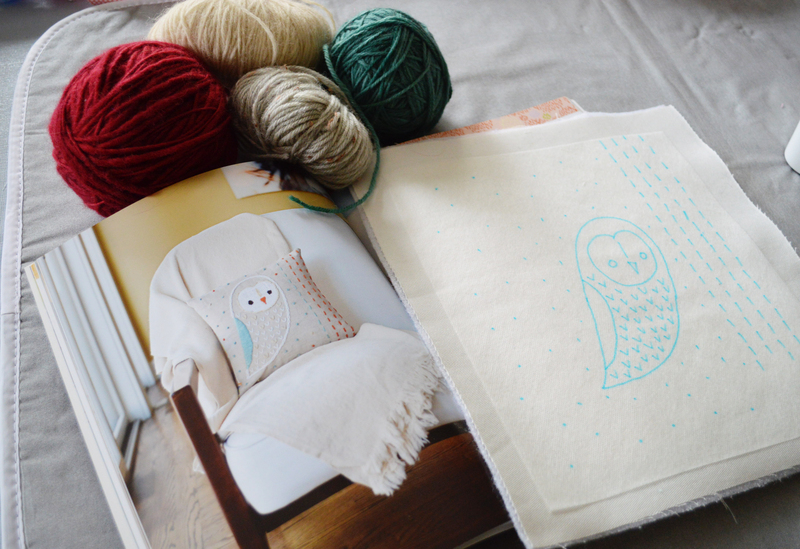 We are dedicated readers of her blog and did a little happy dance when she released her first commercial pattern. You can imagine, then, how excited we were for the release of this book. We love seeing people in our industry succeed, but it’s particularly exciting when that someone is as talented and all around fabulous as Sara is. We adore her and know that she deserves all of the success that comes her way. Is it possible that we’re a little biased? Perhaps. But it’s hard not to be when you consider that there are 4 full pages dedicated to Pellon® interfacing — what to use, how to use it in bag construction, and a detailed description of Sara’s go-to products. Sara has been educating readers on the different uses for and benefits of interfacing on her blog for a while now and it’s safe to say she’s become a go-to on the subject in our industry. 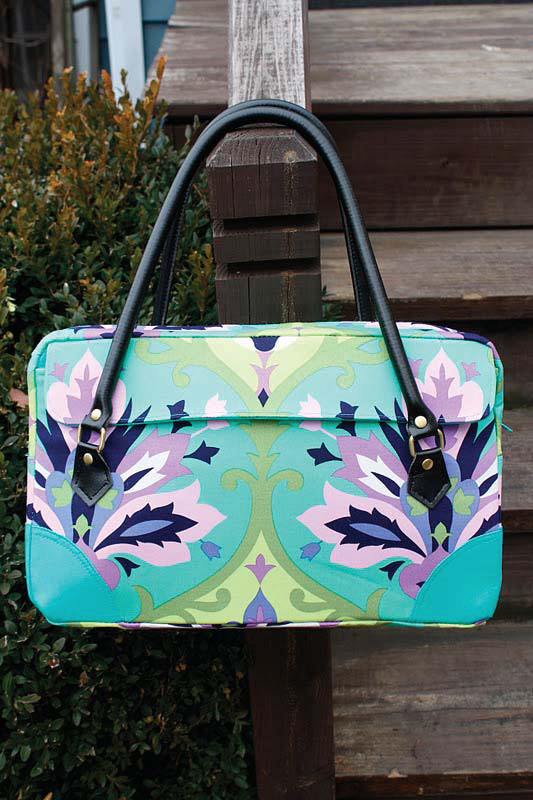 In addition featuring a section on interfacing, Big-City Bags gives instructions for how to create 12 super-stylish bags. Martingale has a great post today that features Sara talking all about the process of putting together her initial book proposal AND a whole video dedicated to interfacing tips!! The video was filmed at Fall Market in Houston and serves as a fabulous introduction to Sara’s book. After you’ve learned all about Sara and Pellon® interfacing you’ll definitely want to enter-to-win a fabulous Pellon® prize pack. 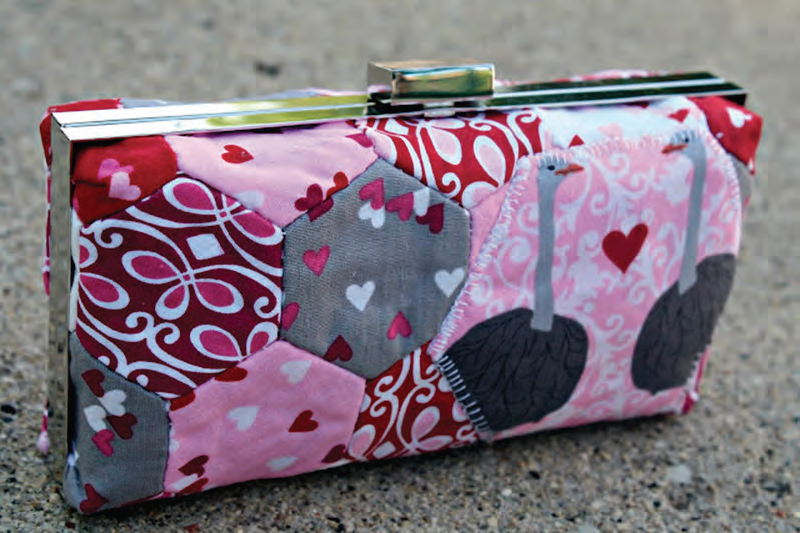 We worked with Martingale on this one are excited to offer all the products needed to complete one of our book favorites, the Miss Independent Bag. The Miss Independent bag is a laptop bag that looks like a high-end handbag. There’s room for all of your day-to-day items, along with a removable zip-top laptop sleeve. The prize package includes Pellon® SF101 Shape-Flex®, Pellon® TP971F Fusible Thermolam® Plus, and Pellon® 520 Deco-Fuse™. So, don’t forget to head on over to Martingale!! Now… for our very own GIVEAWAY!! Since we love giveaways, we thought it only fitting that we feature one here as well. Martingale was kind enough to offer a copy of Big-City Bags to one of our readers. One lucky winner will get either a print or an e-copy of Sara’s book. 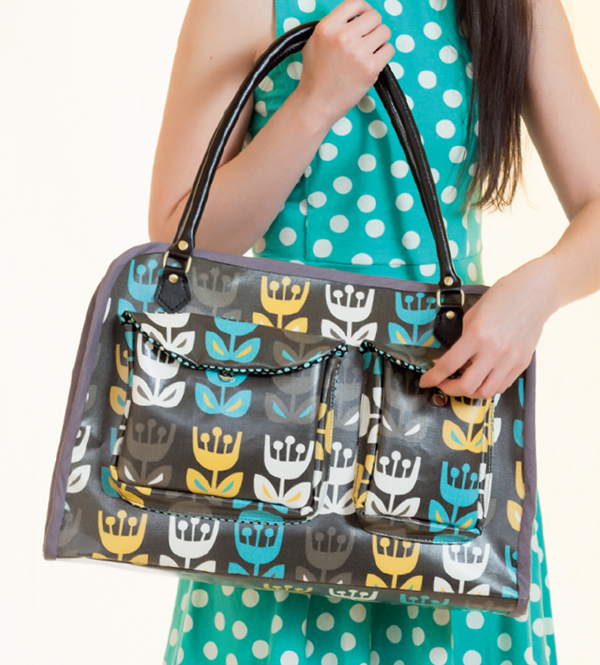 To enter-to-win, head on over to Sara’s profile page on our website to check out all of her designs for Pellon®, then come back here and in the comments, tell us which one of her bags you’d most like to make. We’ll select one winner using our pal random.org one week from today. Good luck & Happy Sewing!! 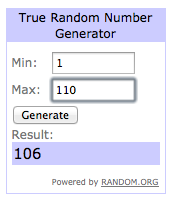 Congratulations to our winner, commenter #106 Joan!! Joan — we sent you an email:). Thank you to all who entered. If you’re interested in purchasing a copy of Sara’s book, head on over to Martingale! Have you noticed how many amazing new books are coming out this season? Our wish list is growing longer and longer and we’re SO excited to dive right in and start creating. 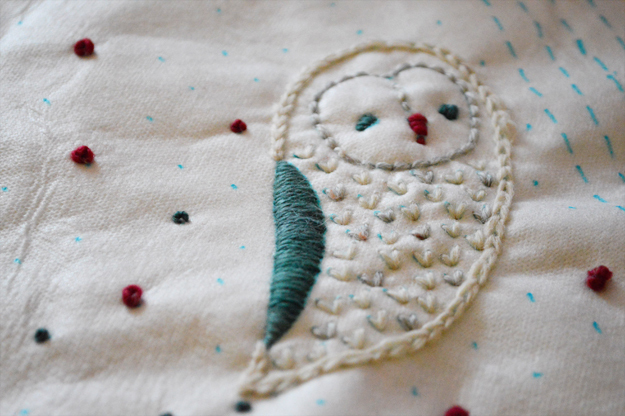 You’ll be learning about a lot of new releases here on the blog and today I’m excited to tell you about the first, Sew + Stitch Embroidery by Alyssa Thomas of Penguin & Fish. I had the pleasure of meeting Alyssa in Portland, OR at this year’s Spring Quilt Market. She was super sweet and immediately mentioned that she adores using Pellon® products and had, in fact, used them for most of the projects in her book. Though I’m obviously biased, I adore hearing things like that… that designers, quilters, sewists and creators use and love our products. When I got a note from her and her team about the book release and upcoming blog tour, I was more than thrilled to jump on board. I received the book last week and it’s gorgeous. The photos are nicely staged, clean and do a wonderful job of showcasing the projects included. 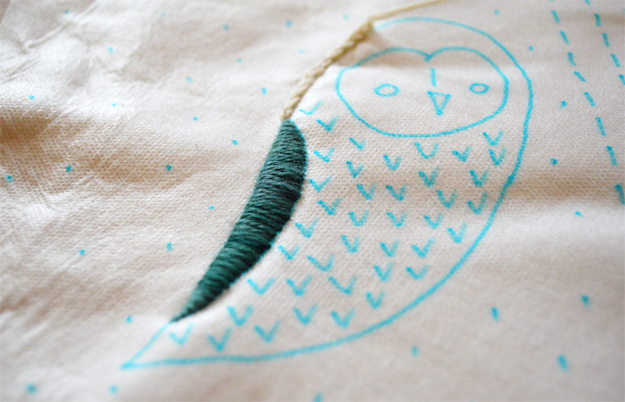 There is an easy to follow introduction with all sorts of embroidery basics, including a section on how to effectively use an embroidery stabilizer. 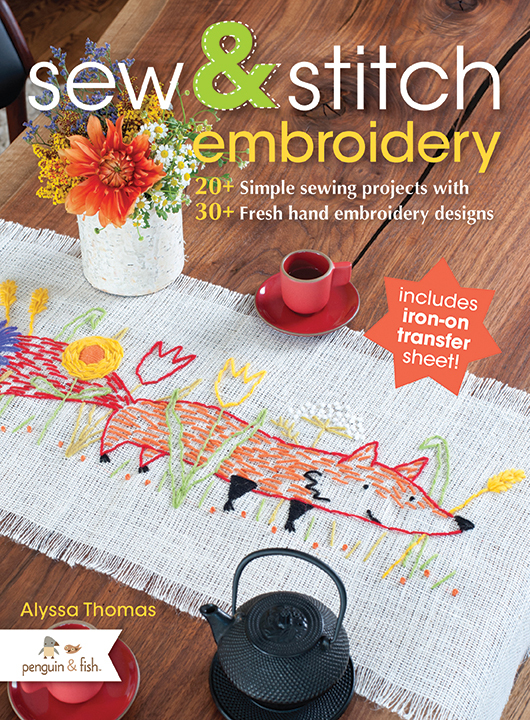 Alyssa also takes readers through basic stitches, making the projects completely achievable for beginners. Always up for a challenge (even as a beginner!) I thought I’d try to tackle one of the smaller projects. 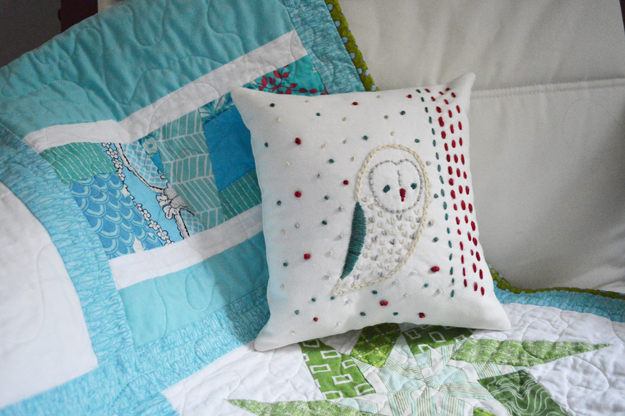 After flipping through, I decided on the barn owl throw pillow. It didn’t seem too complicated and I thought it would be a relatively quick sew (good since I sat down with it on Sunday!). I used a white linen backed with Pellon® 987F Fusible Fleece as my base and transferred the embroidery pattern via Pellon® 542 Stick-N-Washaway™. I did not enlarge the design as the book suggests, but instead opted for a small pillow with some extended stitches, resulting in a finished size of about 10″ x 10″. I had some yarn leftover from various knitting projects and did my best to match colors. The end result is different, but I still love it! The stitch guide suggests some simple back-stitching, along with the chain stitch and french knot, two stitches which were somewhat new to me. I had a very easy time following Alyssa’s instructions and feel like I was able to achieve the desired result, even if some of my french knots are a little on the loose side;). The chain stitch was also much easier than I expected! Once I finished the embroidery, I simply cut a second piece of linen to match the first, backed it with Fusible Fleece, and stitched the 2 pieces together with right sides facing. I left a 3 inch gap for turning, clipped the corners, turned it right side out and stuffed it with Pellon®’s Perfect Loft™ Cluster Fiber Fill (LOVE that stuff!) I then hand-stitched the opening closed. The resulting pillow is an adorable little addition to my daughter’s (almost finished!) nursery. I’m looking forward to trying another project from the book and just have to narrow down my options first. To learn more about the book, head here and make sure to check back tomorrow!! We have a special guest post planned courtesy of author, Alyssa Thomas. She’s put together a special tutorial just for our readers and she’ll be sharing it right here on the blog. We’re so thrilled and have no doubt that you’ll love what she’s put together. See you tomorrow! This week marks the second post for designer Alison Glass. 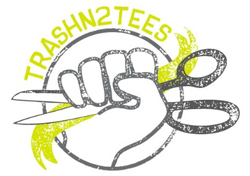 If you missed the first post, simply click here. Take it away Alison! Product Review: Pellon® 987F Fusible Fleece — Using 987F as a backing for quilt weight fabric in an upholstery application. Purpose: Research adding bulk and stability to quilt weight cotton to make it an appropriate weight for use in upholstery projects. Project: Recovering a vintage arm chair in quilting weight cotton fabric backed with fusible fleece. 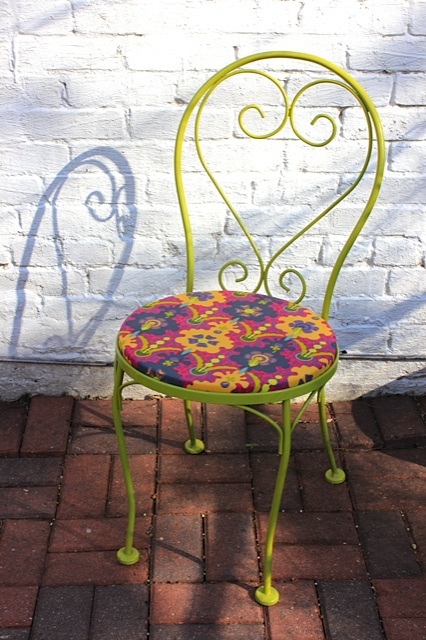 The chair will get a new coat of paint to go with the new fabric! Mural in Night from the Lucky Penny collection by Alison Glass for Andover Fabrics. 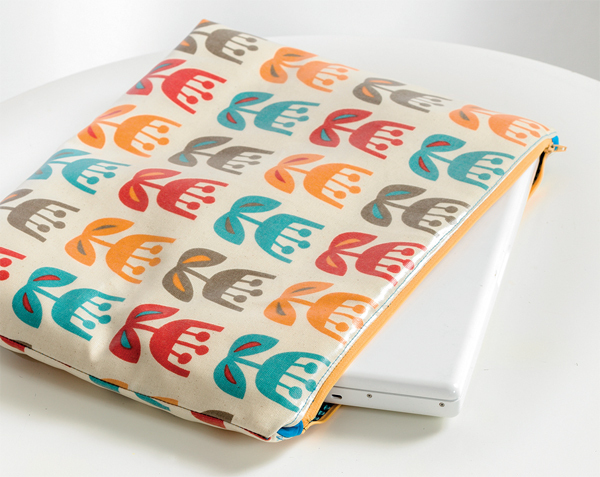 The 987F Fusible Fleece was very easy to work with and apply to the cotton fabric. I followed the directions for a “light bond” and had no problem with the two adhering to one another. The two fabrics seem to have similar stretch and move well together. I have to say, I was a bit skeptical that this would work, but it did, and so well! The fleece moved and stretched with the quilting cotton beautifully, it really seems that the two are like one substantial fabric. In addition, the little bit of added padding the fusible fleece gives really helps to smooth out the surface of the fabric, but without a lot of bulk. 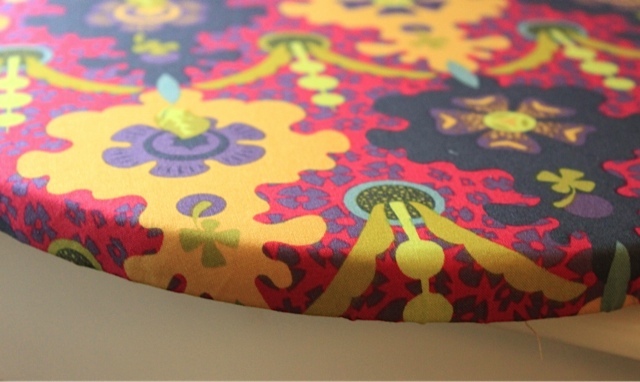 Frankly, it was easier to work with and in the end looks nicer than some upholstery fabrics I have used in the past. I am really looking forward to seeing how this will wear over time, but I feel confident that the fleece has given the quilting cotton the little extra it needs to continue to look beautiful and function well over time. 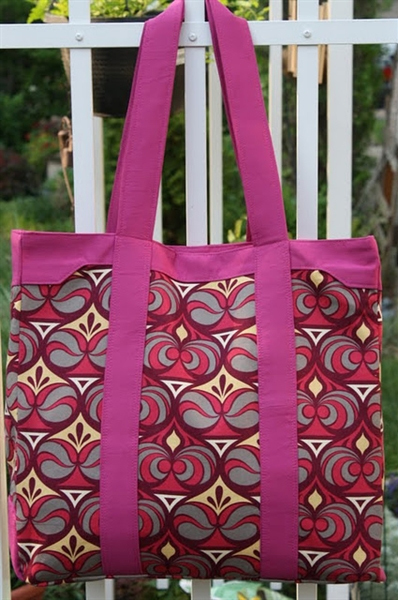 The thing I am most excited about is the doors this opens up for using some amazing quilt weight fabrics for these type of projects. 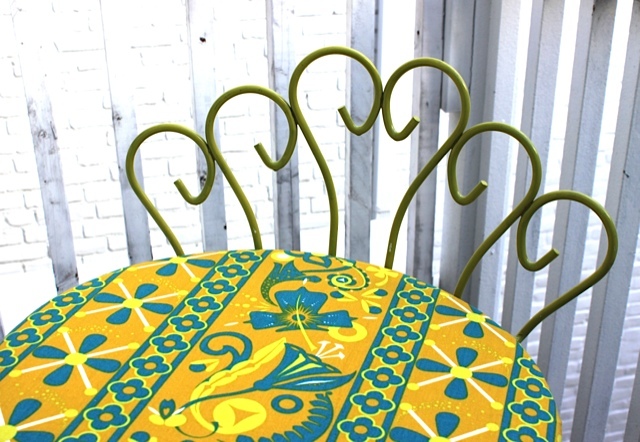 Pellon® 987F Fusible Fleece is useful for a lot of projects, and this is yet another. 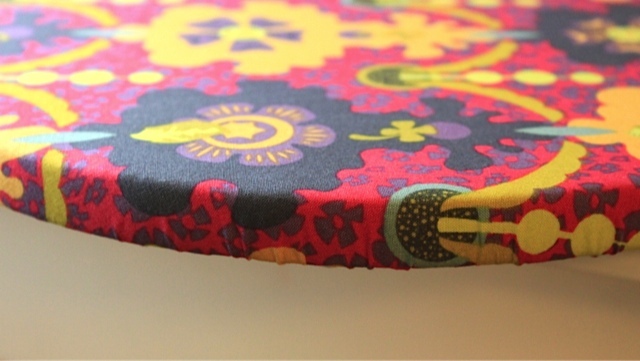 I am thrilled to have found a product to add to all of the gorgeous quilt weight cotton fabric out there in the world that allows it to function well in upholstery projects. I think I might need more vintage chairs now! A HUGE thank you to Alison for sharing her findings with us! We’re really excited about getting started on a new home decor project:). This week, we’re thrilled to kick off another series of guest posts featuring the incredibly talented Alison Glass. Alison and I first met at Fall Quilt Market last year. She was very interested in working with different Pellon® products to turn quilt weight fabrics into something more suitable for home décor. Think of your favorite fabric line and then imagine it as a cover for your new ottoman (or couch, love seat, dining chairs, etc…) Alison was hopeful that her experimentation and subsequent findings might open up a whole new world of possibilities for home decorating and upholstery. So, without further pause, I hand the reigns over to Alison! Product Review: Pellon® ES114 Easy-Shaper®, 931TD Fusible Midweight Interfacing, & 808 Craft Fuse®. 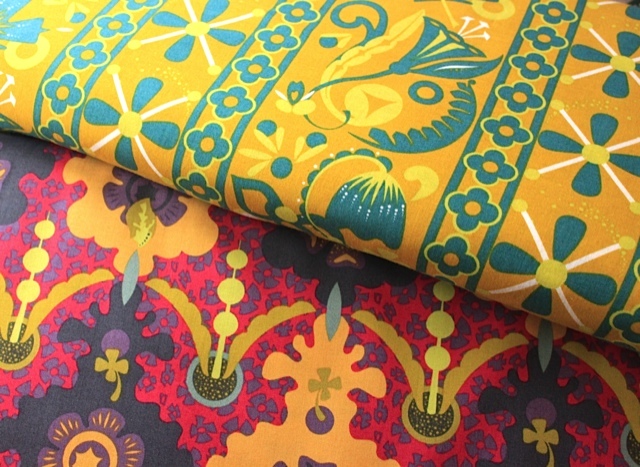 Comparing and contrasting three Pellon products for use as a backing for quilt weight fabric in an upholstery application. Project: Recovering the seat bottoms of three chairs with three different products. All chair bottoms are round and similar in size. Fabrics Used: Column in Morning and Fountain in Night from the Lucky Penny collection by Alison Glass for Andover Fabrics. ES114 seems the lightest of the three interfacings. It does not have much stretch, but it is not stiff either, which is helpful. It was the most difficult for me apply to the fabric, and took the most amount of time in this part of the project. It didn’t seem to stick as well, but I also was not being very patient. It really did need to cool completely to stick, but the fabric was very smooth without any puckering, which is super, and something that I thought might be a concern, but it wasn’t. 931TD is a nice weight, and has a good amount of stretch. 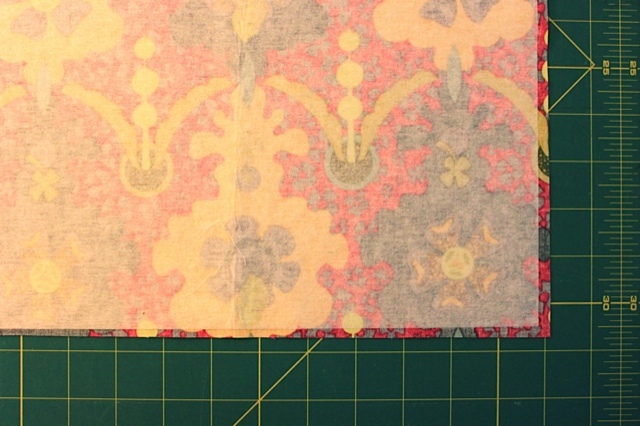 It mirrors the stretch of quilt weight fabric quite well, and it was easier to attach to the fabric than ES114. This group was also very smooth without any puckering. 808 is the heaviest and stiffest of the three. It was easy, easy to apply to the fabric! Very fast, very smooth, and I can see tons of projects that this would be a great product for. ES114: This worked pretty well. There is some puckering around the curves, but it is workable. A little more stretch would be preferable, but the finished seat bottom looks good. 931TD: First choice of the three! The amount of stretch is very good for this application. There were very few puckers and the fabric/interfacing combination worked well together, as one piece, with stretch but also stability. 808: This was by far the hardest to attach with the most puckering around the curves. It is, to me, a bit stiff for upholstery. The fabric cannot stretch at all. While all three products are wonderful, 931TD is my first choice for this purpose of the three. There are so many great quilt weight cotton fabrics, finding a product that can add some weight so that the fabrics can be used for upholstery is exciting. As far as how the fabric will wear, that will need some time, however as far as working with the fabric, the stretch that 931TD allows the fabric to maintain, as well as the combined weight of the two is key to making this a workable project. As a note, if curves were not involved in the project it would make less of a difference since working around them would not be necessary. In that case 808 would also be a good choice. 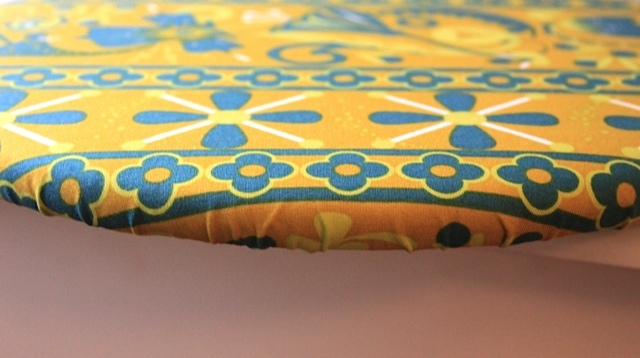 The reality is though, that most upholstery projects do involve some amount of curves. Also, I did really like the 808 Craft Fuse, and as I stated earlier, can really see how it would work VERY well for a lot of projects where a good amount of stiffness is needed. It almost made the fabric similar to a heavy weight paper, almost foldable. Very nice. Up next: Using 987F Fusible Fleece as a backing for quilt weight fabric in an upholstery application.